LR: She's One Life to Live's mother from hell, and he's the father of a mob boss on General Hospital, but to millions of Ryan's Hope fans they will always be Roger and Delia. Take a look. DELIA: (in tears) I don't want to break your heart. I'm just trying to be sensible. ROGER: Love isn't sensible! It's madness! DELIA: I don't know what it is about this apartment. ROGER: It isn't the apartment; it's you and me. 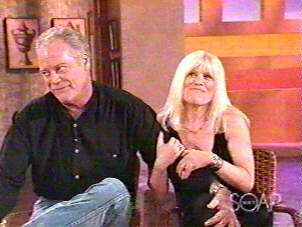 LR: Here they are, together again, Ron Hale and Ilene Kristen. LR: Well that was fun. ILENE: That was scary, seeing that! TT: They actually walked like that, all the way from New York, he carried her. LR: So are you still recognized from being on Ryan's Hope? RON: I would say it's about 60/40. 60% of the time it's Ryan's Hope. LR: Over General Hospital and over One Life to Live? ILENE: Well, all of a sudden now, with One Life to Live, it's starting to happen. But, for a while, even when I was first back on One Life to Live, it was still Ryan's Hope. TT: Well, for One Life to Live, for you to be recognized, you gotta tease your hair out to here. A Jersey girl! ILENE: I'm incognito right now. RON: I get the same thing. People come up to me and say "I love you on GH, and what's Sonny really like?" - you know, I get that all the time - but then they'll say, "And I used to watch you on Ryan's Hope all the time." ILENE: Ryan's Hope had an amazing impact on people. LR: Why do you think that is? TT: The Levines (sic), obviously. ILENE: She was very...a very special writer, and Paul Mayer, and they wrote an amazing bible for the show. TT: Like a long story. ILENE: It was very long, and I was not particularly interested in doing a soap until I read what they had written, and it was really incredible - the character sketches of each of the characters. RON: And we're still doing it....1975, and, you know, a lot of the shows at that time, you still had the old formula, where people were sitting around sipping coffee, talking about other people, that sort of thing. LR: So you were dealing with the issues, as opposed to talking about them. LR: And that's more interesting! RON: Even the extras in Ryan's Bar used to amaze me when we had Ryan's Bar set up. ILENE: (laughs) We had some characters! RON: You'd walk in, but what they'd done - wardrobe and makeup and everybody - you'd have guys sitting there dressed as New York cops, dressed as sanitation workers, just like you do in real New York bars. You know, guys sitting there having a sandwich. ILENE: I know we miss working together, that's for damn sure. LR: Why do you think they were such popular characters together? RON: Well, I don't know, we fell into something there, that I think was so lucky for the both of us. We were the baddies. There was no getting around that. TT: It's good to be bad. ILENE: And I was so confused! RON: Well that was just it. Everybody understood why poor Delia did the things she did. It was so well scripted. I mean, you understood this was not a one-dimension "I'm just gonna be a bad guy" - Delia had so many deep-seeded problems as a child, she needed to be a part of the Ryan family desperately, she would do anything to do that. TT: That's what I was gonna say, you guys added a lot of your own personal flair for comedy. TT: There you are baby! RON: That is not fair! 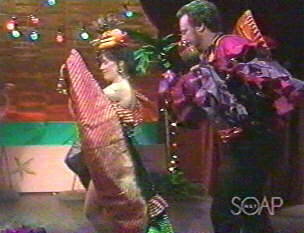 TT: (to Ilene) Cause, you're a professional dancer, you're a trained dancer. ILENE: Yes, I started off as a dancer, and I...right before I did Ryan's Hope I was doing Grease on Broadway. I was the original Patti Simcox. TT: Now, you were doing Grease on Broadway, and they came to you and they said, "Hey, would you like to be in Grease the movie"? TT: Oh, that's what I heard. ILENE: (laughs) No, who told you that? TT: Well, I read it somewhere and I was like, "Well, she dodged that bullet, it's a good thing she dodged that bullet, working with that John Travolta!" TT: Good career advice, John! ILENE: He said, "They're cutting the part down," which they did, they cut the part down. LR: Who played the part in the movie? I don't even remember. ILENE: Susan Buckner. She's not, I don't think she's in the business anymore. LR: No, I don't either. ILENE: No, she's there, but it was kind of different, so I wasn't really interested in...I never actually, the funny thing is I never wanted to play Patti Simcox, I always wanted to play Marty in Grease, the bad girl. TT: Ron, you were busy doing Academy award-winning All the President's Men, with Robert Redford. TT: Talk about some good writing. RON: And Bob. Yeah, I was in Washington, DC doing All the President's Men and my agent called and said, "On your next day off, can you get to New York? They're auditioning for a new soap opera." And I said, sure, and to make a long story bearable, I came up, auditioned, and went back something like 2 or 3 weeks later and auditioned, and I knew the movie was ending and it was like, "Where is the next job coming from?" RON: And I signed a contract for 13 weeks - that was exciting, knowing I had 13 weeks! LR: Right, as an actor, that's a long time! RON: Thirteen weeks, I got a steady paycheck. LR: RIght. Well, when we come back, more. 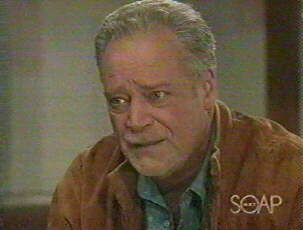 TT: Welcome back, we're here with Ron Hale - that was a scene of his from General Hospital - and Ilene Kristen. Now, for GH, you didn't have to audition for that, is that correct? TT: That's like, actor's dream. TT: Who's been in Lisa's Soap Box. LR: Yes, he's come and...we love him. He's a terrific casting director. RON: And somebody had seen me on the street here in LA or whatever and he heard that I was here and he knew this role was coming up and he tracked me down and called me up and said, "We've got a role coming up, 4-6 months, we kill you off, are you interested?" LR: And you've been on for eight years? RON: And I said, "Uh, sure, how much," you know? LR: Yeah, exactly. All about the money! RON: "How much," then I said "sure." LR: I'm teasing, but, you know, it's one of your first questions. RON: Yeah, well of course. ILENE: I kind of thought that it was kind of over. 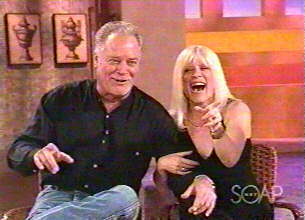 ILENE: Yeah, because, you know...I don't know...with Ryan's Hope we had pushed the envelope so much and I was looking back at some of the soaps - and actually a friend of mine, her favorite soap is One Life to Live - and she said, "You should be on that show," and I said, "I don't think there's a place for me." TT: Little did you know. TT: Before we go, I do want to ask you about a castmate that you recently lost - we all lost, really - Nancy Addison. ILENE: Yes, a terrific loss, she was the most beautiful, elegant person, she was one of my very dearest friends, I learned more about friendship from Nancy....just too young and so wonderful, and she battled cancer for three and a half years. TT: A very brave soul. ILENE: We did a memorial for her the other day. RON: Last Wednesday in New York. ILENE: I sang. I wrote a song for her called "Flesh and Blood" and it was something that I really wanted to do. I was hoping that I would never have to do that song. ILENE: Yeah, I was hoping I would never have to do it, I was hoping she wasn't gonna die, but I knew about a year ago that this was gonna be the end. So I worked on it and I was just hoping I could put it away in the drawer. RON: And she was my sister for thirteen and a half years on Ryan's Hope, and she was like a sister to me. ILENE: Yeah, she was like a sister to me also. RON: And we all loved her so much, and she did so much for charities, for children with AIDS the last few years, she was wonderful, and we'll miss her. TT: So, Ilene, now you play Roxy, who's possibly the worst mother in history. RON: And I'm the worst father in history. TT: Well, you were, but you're making it up now. ILENE: I may never make it up to those kids - if we knew who my kids actually are. You know, it's been great. I have had the greatest...really, a great time. LR: And you look like you're having fun, because I catch it from time to time, and I hadn't followed the show until I met Ty of course, and I just think you are terrific, really terrific. TT: We actually have a great clip of you - from the live show - we have a great clip, we'll take a look at it. ROXY: Yeah, I had a feeling that I could make you forget your problems with your kid. ROXY: And I hit the jackpot, more than once. RON: She used to do that with me! ILENE: (laughs) But not live! This was live. TT: That was on live TV, yeah, and I sat in the set across the studio from you watching. 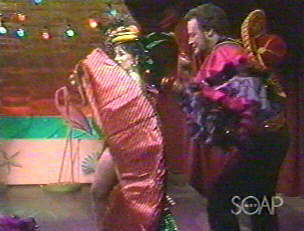 ILENE: That was pretty scary, to do that live, cause I was barely dressed. (laughs) I had to flash him at one point, also, so it was pretty scary, and it was really scary cause it was going well during all the rehearsals and then you get really scared, cause then you go, "I've got nowhere to go but down." ILENE: Yeah, really, you know, they say, "Good dress rehearsal show, bad show," you know? So it was really scary. The live week was great. TT: Well, you guys are somewhat used to that from Ryan's Hope - somewhat, as far as you taped that way. ILENE: Well, the way that we used to do it, they didn't like to stop tape, and the scenes were very long. We had like ten, twelve page scenes. ILENE: And they didn't like to stop. Every once in a while I'd have to stop though, because there was so much dialogue. It was like a little mini play. RON: But you see, back in those days, we didn't have our own tape facilities. Now all the shows have their own tape facilities at the studios. We were only alotted something like 45 minutes of tape time a day, and we were doing a half hour show. TT: I usually take fifteen minutes all by myself! RON: Literally, it was like live TV. We were all in our separate sets when they started taping - you'd tape the scene, the cameras, everybody would...down to the next set, booms, everything, stage manager would get there and go, "5, 4, 3, 2, 1," and you were on. If you were in the last scene of the day and people early on had stretched, they would come to you at the last minute and say, "You've gotta make up 30 seconds in this scene," or, "You've gotta make up a minute." TT: My favorite is the other way. RON: And there were no cuts, so we had to make the decision as actors, like that, "Where do I speed up? What's important? What isn't?" ILENE: I learned how to talk very fast. TT: My favorite is when they come to you and go, "You know, we're a minute short. You've gotta make up a minute. Just do what you want for a minute. Anything you want!" ILENE: You know, sometimes when you go that slowly, though, the lines are like drifting away. LR: Now, would you like to work together again? ILENE: Oh, it would be great. TT: They should do more crossovers. LR: You could cross over, same network. LR: Put it out there. RON: (puts his finger to his lips) Don't say anything more. ILENE: (laughs, hugs him) Okay, I won't say a word. LR: Well, we hope that for you cause you are terrific together, terrific. TT: The fans would sure love it. LR: Thank you so much, for being here, for coming. TT: Thank you Ron, thank you Ilene. 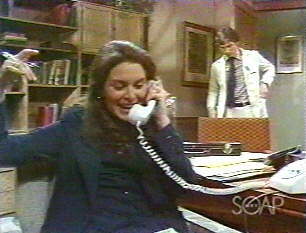 You can catch Ron and Ilene on General Hospital and One Life to Live - and, of course, on the classic episodes of Ryan's Hope - all right here on SoapNet. Don't go away.